Hyve Mobility Pvt Ltd, an Android-based smartphone venture started by former Apple India enterprise head Sharad Mehrotra, has unveiled its first two smartphones â€“ Buzz and Storm. While Hyve Buzz is priced at Rs 13,999, Hyve Storm comes with a Rs 8,499 price tag. The smartphones will be available on Flipkart, Amazon and Gadgets360.com from June 22. Both the dual SIM smartphones will run stock Android 5.1 Lollipop, and an Android Marshmallow update has been promised. The Hyve Buzz features a 5.5-inch FHD (1920x 1080p) 2.5D Arc Glass Curved display. It comes with MiraVision technology for better user experience. It sports MediaTek 1.5GHz Octa-core processor, 3GB RAM, 16GB storage, 32GB microSD card, 13MP rear camera with Sony image sensor and a 5MP front camera. The phone comes will support VoLTE. Featuring the new USB Type-C reversible connector with fast charging, the Buzz boasts a 2500mAh TrueLife battery that claims to offer 15 hours of talktime on 4G and up to 22 days of standby time. The water-resistant smartphone has a rubber back and a rear fingerprint sensor. The phone's highpoint is a fingerprint-based sensor that comes with the patented Touch2Call technology allowing users to make calls to pre-set numbers with a single touch. On the other hand, the budget smartphone Hyve Storm has a 5-inch HD display and is powered by MediaTek 1.3GHz quad core processor. Besides featuring 13MP rear camera and 5MP front camera, the smartphone has a metallic look and comes with 2GB RAM, 16GB storage, and 2000mAh battery. The startup claims to have set a benchmark on the services side. It has rolled out Hyve Care, its customised service play, which offers extended warranty and complimentary insurance for the first year with these devices. It also offers IVR-free call centre support and complimentary pick-and-drop service. 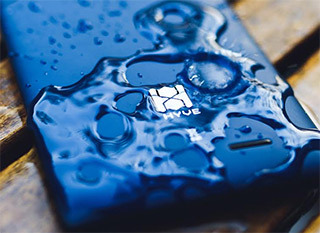 Hyve Buzz will come with a two-year manufacturer's warranty, while Storm will boast a warranty of one year. "It is aimed at offering smooth and easy servicing of the device which also includes pan-India pick-and drop. Service is something which can change the game in the Android space," said Mehrotra. Hyve Mobility aims to sell one million devices over the next one year. It is also looking to launch a new product four to five months later, during the festive season. Founded in January this year, Hyve was started by Mehrotra, along with longtime business associates Aditya Agarwal and Abhishek Agarwal. Aditya Agarwal heads authorised Apple resellers in India, Euphoria Retail LLP and 4 Genius Minds, while Abhishek Agarwal is joint managing director of 4 Genius Minds. Hyve will be the latest entrant in an extremely crowded market. India's smartphone shipments in 2015 grew 28.8% to 103.6 million units, positioning the country as one of the fastest growing smartphone market in Asia Pacific, according to the latest report by International Data Corporation (IDC). In the first quarter of 2016, 4G based device shipments accounted for 65.5% of overall smartphone shipments. This sharp rise in the share of 4G smartphone is due to the cohesive move from the entire ecosystem, according to the market research firm.